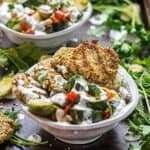 These Protein Packed Falafel Bowls are a great vegetarian meal prep idea! While the quinoa is cooking roast your vegetables. Toss your favorite assortment of vegetables with olive oil, salt and pepper. Bake for 20-25 minutes. Once the vegetable have finished, turn up the oven to 450 degrees. Then blend all of the falafel ingredients (chickpeas, parsley, garlic powder, onion powder, salt, cumin, baking powder, quinoa, and red pepper) in a food processor or blender until a dough like consistency is formed (it will be crumbly!). Using your hands squeeze together about 1/4 cup of “dough” into a firm ball (don’t be shy about it! You’ll have to really squeeze hard or they won’t stay together). Press the ball onto the counter to form a patty, like you do to make hamburger patties (optional: press them into sesame seeds for a crunchy exterior). Place the falafels on a baking sheet and drizzle 1 Tablespoon of olive oil on top of all the patties. Bake for 15 minutes, flip, and bake another 10 minutes. While the falafel bakes, mix together all of the ingredients for the yogurt sauce (yogurt, cucumber, garlic powder, salt, pepper, lemon, sugar, and dill). Refrigerate until serving.